Developing a keto bread recipe was quite a challenge. Texture, flavor, rise, moisture-- these were just a few things I had to get "just right". This recipe is the result of dozens of trials. I'll tell you more about that later! In the end, I turned to coconut flour because everything I attempted with almond flour turned out too wet. Yeast is another crucial ingredient to get a higher rise that doesn't cave in at the end. If you're looking for a keto bread that tastes great and works well for sandwiches, french toast or just to toast with liberal amount of fresh organic butter--this is a great recipe to use. Yet, baking keto bread was a whole different ball-game. I started by searching the web “How to make keto bread”. I picked a few different “well-rated” keto bread recipes and started baking. Results from these recipes were very “wet” and had an “off” flavor. Many of them contained psyllium husk powder to which I grew a quick aversion to. I did not like the flavor that the psyllium husk gave to the keto bread. My results….. the end product that came out of the oven resembled bread in appearance but not in taste or texture. I didn't see a point to even bothering with keto bread if this was the result. I wanted something that would make a great keto sandwich bread. I also wanted an easy recipe that anyone (including my husband) could make! As I talked to friends and clients, they shared horror stories of their keto bread attempts. Most told me they had given up on ever eating a good tasting keto bread. But… wouldn't it be nice to have a grilled cheese sandwich again? Or some french toast? All keto friendly of course! I relish an “impossible” baking challenge. Experimenting in the kitchen is one of my favorite things to do. (My husband and kids also love it because they get to do a lot of sampling!). I was (and am) determined to figure out how to make keto bread that is both easy and delicious. Can I Substitute ________ ? My early attempts at keto bread used a mixture of almond flour and coconut flour. I learned that almond flour doesn't absorb moisture like coconut flour does. I wondered if this was part of my “wet” problem with my previous breads. In this version I used all coconut flour. Coconut flour does absorb moisture and requires more eggs than if I was making a bread with almond flour. I used Acacia Fiber to give the bread more structure without imparting the nasty flavor from ground psyllium husks. I also used ground Flax and xanthan gum to give the bread texture. The flax also imparts just a touch of a “wheat” flavor to the finished product. Omitting the flax results in less of a ‘rise' but still yields a delicious loaf of bread. I STRONGLY recommend weighing your coconut flour and not relying on a measuring cup. Why? 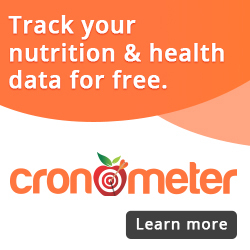 These ingredients aren't cheap and it is incredibly easy to get an incorrect measurement. Incorrect measurements will give you inconsistent results. If you go on Amazon and look at kitchen scales, it's easy to get overwhelmed. I have two kitchen scales. The first one I purchased is an older version of this Pronto Digital Scale. I eventually upgraded to this Kitchen Scale by My Weigh because I wanted a larger base to weigh on and I just love the cover on it which prevents me from constantly having to try and dig flour out of the display of the smaller one. I now use my original purchase for traveling! Seriously? Yeast in Keto Bread? After multiple keto bread failures, I spent a month diving into learning the science of keto baking. I ordered a diverse range of keto ingredients to try in my version of keto bread. I made many keto bread recipes but struggled to find the perfect combination. This was turning out to be a bigger challenge than I had imagined. I had the texture right but the bread tasted ‘sweet' as a result of the almond and coconut flours. Can You Believe This Is ALL The Coconut Flour You Need? I hadn't thought about using yeast in a keto bread. Yeast reacts with gluten–and I didn't think it would work in a non-gluten bread. Is it ok to use Yeast in Keto Bread? As I dug into the facts, I came across a blog post by Dr. William Davis. Dr. Davis is the author of Wheat Belly and my earliest exposure to a grain-free diet. We heard him speak at a Young Living conference in Utah! He indicated that we could, in fact, eat yeast. He goes on to say that some can tolerate it and other's can't. Here's a link to his article. There's not a lot of good information about using Yeast in a grain-free bread. I started with using “Instant” or “Rapid Rise” yeast. I proofed the yeast (fed it with sugar) before pouring it into my recipe. My research had explained that the yeast would eat the sugar. The sugar is what “feeds” and activates it without the gluten found in wheat flour. I experimented with rise time for the dough. In the end, I discovered the best rise happened by proofing the keto bread dough. To do this, you place the dough in a warm (200 degree) oven for 10 minutes. Then, remove it from the oven and cover it in a warm spot in your kitchen. (I used my microwave because it's a warm environment above my oven. Any warm environment would work to continue the rising time of the yeast). Finally, we bake the bread in a preheated 350 degree oven for 30 minutes. This coconut flour keto bread recipe turns out a beautiful keto bread that can be used for sandwiches, french toast or plain old toast with a liberal amount of fresh organic butter. Yum. If you don't have a "Bread Proof" setting on your oven, preheat your oven until it gets to about 100 degrees and turn it off. Put the keto bread dough in there to warm up. When you remove the dough from the oven, cover it and place it in a warm spot in your kitchen. Our microwave is above our oven, so I place it in there so that it continues to rise. It's important to keep it warm, otherwise, you'll end up with a result that falls in the middle. Fresh yeast is also important. Use instant yeast (rapid rise) and make sure you feed it with the sugar. The yeast will eat the sugar, so don't worry about adding any carbs to the end result. You can also use honey in place of sugar. Grease a bread pan heavily around the bottom and sides with butter, ghee or refined coconut oil. Let sit for 5 minutes. It should be foamy. Meanwhile, in your mixer bowl. Combine: 6 eggs (room temp) and 1/2 c olive oil. With a flat or regular beater, blend until combined. Add: 1 Tbs Acacia Fiber,1 tsp xanthan gum, 2 Tbs Ground Flax, 1/2 tsp salt, 3/4 cup coconut flour (108 g) and blend until combined. Now add the foamy yeast to the egg & coconut flour mixture and beat for one minute. Let rest for one minute. Beat for one minute. Repeat 3 times. 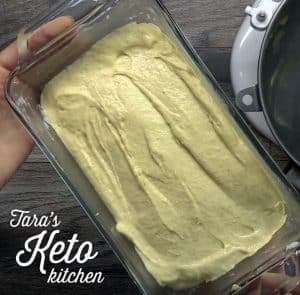 Pour the keto bread dough into a greased bread pan. Smaller bread pans will yield a taller loaf. Using a bigger bread pan gets you a loaf in different dimensions. Place in a 100 degree oven for 10 minutes to "proof"
Remove pan from oven and leave covered in a warm place in your kitchen. Set your oven to 350 degrees. Let bread dough sit covered on the counter for 20 minutes while your oven preheats. Your bread should continue to "rise" and grow in size as the yeast performs it's magic. Remove from the oven and set on a cooling rack. Allow bread to cool completely (about 2 hours) before removing from the pan and slicing. Store on the counter for 2-3 days or slice and keep in the freezer for a few weeks. Note: You can omit the ground flax if you wish. Expect less of a rise and a little sweeter flavor to the finished keto bread. This bread turns out much less sweet than the quick bread version! You can also use ground psyllium husk powder, which lends a wheaty flavor to the bread. Make sure to get the ground psyllium husk powder and not the coarse stuff. The coarse stuff doesn't work well at all! And for those of you who asked– the knife in the picture is this one by Cutco. This recipe turns out a beautiful keto bread that can be used for sandwiches, french toast or plain old toast with liberal amount of fresh organic butter. Yum. Preheat your oven to 100 degrees. With a flat or regular beater, blend until combined. Then, add the foamy yeast to egg/flour mixture and beat for one minute. Let rest for one minute. Beat for one minute. Remove pan from oven and leave covered in a warm place in your kitchen. Set your oven to 350 degrees. Let bread dough sit covered on the counter for 20 minutes while your oven preheats. Your bread should continue to “rise” and grow in size as the yeast performs it's magic. The text says proof at 200 degrees but the recipe says 100. Big difference so need to be sure which is correct. Amazing recipe! Can i substitute olive oil to coconut oil? Thanks! Still wondering if anyone has used a bread maker? It does the first rise (proofing) for you at the optimal temperature. I still have my bread maker from my pre-keto days, and since I can’t seem to give it away (nobody wants it), I may as well try to make a good, yeasty keto bread. I’ve been making psyllium husk bread, too, but I can no longer stand the stuff. I hate the “gritty” texture the psyllium adds to doughs. I’m interested in the same – whether anyone has used a bread machine, and if so, were there any alterations to preparation, measurements or time? I wonder, instead of making a loaf, I could separate it and make rolls? Any suggestions? Yes, I think so. I would suggest using some kind of mold…either a hamburger bun mold because I think the batter would spread too think otherwise. I would love to hear how your experiment turns out! I was making a n almond flour bread and I liked it but at times it was a bit eggy, so when I saw this reciepe, I gave it a try. I followed your instructions to the letter and instead of one large loaf I used two mini pans, and only baked them 22 minutes. They turned out great, they did not deflate and the kitchen had a slight air of fresh bread to it. So much so, my husband came to investigate, and even though I told him the bread was, as he puts it “my keto crap” he wanted to try it and I got the best complement (or rather you got the complement) of “If all your keto crap tasted like that, I’d eat it all the time” So there you go, a ringing endorsement from a confirmed keto hater…I found my new bread and need say nothing more. What an awesome recipe Tara. The only confusion is about the proofing temperature (100 or 200 C?) because many sources on the net warn about killing yeast at temperatures above 32 C or thereabouts. Any perspective? Looking at the results it looks like you use the ground psyllium or Acacida for flavor. Can they be omitted? It’s actually more for stabilization. You could try omitting them but could see the bread not stay as high of a rise. It could be a few different things. I’m finding that leaving it in the oven and preheating the oven with it still in there works best. Donna, sometimes when you let the dough “over rise” during proofing, the dough loses the ability to stay a bit more solid, thus the “collapsing” effect. Watch the dough rise during proofing and bake before the dough literally doubles in size. There will still be some flattening but not too much. Baking with non-grain flours Has that disadvantage. Hi Tara. Can you please advise temperature settings for australia. Thanks. Hi, I made this twice today, both times it came out of the oven nice and high and I was so excited for it to cool so I could have some, as I was marveling at the beauty of it all of a sudden it just sunk or should I say defleated. The expense to make this two times is crazy only to toss it in the garbage. Sad in Minnesota. Hi Kay–thanks for commenting. I’d like to see if I can help you figure out what happened. A few questions– Did you make any substitutions? You added the sugar to the yeast? Any details you can provide will help with troubleshooting. Thanks again Kay. I appreciate your comment. I understand the principle of yeast consuming the sugar and releasing carbon dioxide, but do you have a source regarding amount of residual sugar after proofing? I can only find bakers claiming this without actually sourcing their remark. Thank you! Is it possible to make this bread vegan? Can “flax eggs” be substituted for the eggs? From my research, I believe the answer to this is “probably not”. Coconut flour is pretty tricky to bake with if you don’t use eggs. Has anyone had any luck with the bread machine yet? Oooh I don’t know about the yeast reliably eating up all the sugar. It will eat some, but it’s a bit risky if you are using the Keto diet to fight cancer. Unless you take your bread to a lab to be tested for 0 sugar, I would avoid making this claim on your site. I was on a very strict no sugar diet for 2 years due to health problems in the 1990’s, and based on what I can recall from my research, the yeast may not eat up all of that sugar. Yeast doesn’t “eat” gluten, as gluten is a protein. What the yeast primarily consumes is carbohydrates; this is why feeding it sugar will work as well, instead of wheat (this is also how wine production works, despite having almost no protein). I don’t follow Keto, but it is worth noting that for something to be Keto, it can contain gluten in small amounts to no ill effect, as gluten is protein. Gluten wouldn’t help the yeast much or make it rise any. What gluten will do to traditional bread is increase the elasticity, and after baking, contribute to the chewiness. These are also the two primary things that give traditional wheat breads their flavor: gluten and yeastiness. To mimic these in grain-free breads, we could in theory add them, though their chemical behavior would be altered with so few carbohydrates to interact with. I’ve been experimenting with the same and came across this blog while trying to see if others had reported any results. Ultimately I am trying to find a method of adding a yeasty flavor without having to succumb to feeding yeast any carbohydrates. To add to your repertoire of grain-free baking ideas… I have made successfully many varieties of muffins and cakes using a combination of oat fiber, egg white and konjac-yam flour (also sold as glucomannan powder). Konjac must be cooked well or it will be slimy, and requires Calcium Hydroxide (aka Pickling Lime) to alter the pH of the water prior to mixing. It is initially expensive but recipes only require a minute quantity. It works well to bind together the other ingredients. I’d share the recipe but have misplaced it when moving and it has been a while since I made them- however, they rise well, and can even be made in the microwave. Perhaps your creativity will find a whole new use for it. Hi Tara, I would really like to try this recipe (for the coconut bread) but have a question – you call for one packet of instant yeast, but the product you recommend looks like it is a 1 lb bag – not individual packets….confused as to how much yeast is in one packet so I know how much to use – thanks! Hi I was wondering if you tried using a bread maker? I was wondering how that would do. I haven’t tried that!! That’s a really good idea. I would think you’d want to use one of the cycles that’s shorter (not as much rise time). Do you use a bread maker a lot? Have you tried using a sugar substitute to feed the yeast? Hi Julie, thanks for the comment. I have not tried using a sugar substitute to feed the yeast. I have used raw honey which worked great. I am not sure if a sugar substitute would work or not. Your comment really got me thinking. I did a little research and found this experiment with sugar and yeast. I think I’ll try it with a few sugar substitutes and see what happens! Which sugar substitute were you thinking of using? If you used sugar with the recipe. How is this keto compliant? I’d like to try this recipe. Still searching for a good bread recipe that can give nice and moist fluffy breads like the gluten versions. Turned out great! Thanks for the recipe! Could Benefiber be substituted for the Acacia fiber? Just made this bread. Came out of the oven nice and high. I thought it was going to be great. However, after 10 minutes of cooling, it sunk. Tasted really bitter and not good at all. Threw it away. Sorry. I don’t know what I might have done wrong. I’m sorry to hear this. I’d like to help you figure out what went wrong. I understand how frustrating it is when your results aren’t what you hoped. Just a few questions– Did you substitute any of the ingredients for something else? If so, what? What part of the country do you live in? Higher altitude? (I’m in the Midwest). I followed the recipe exactly and had the same results as Sherri. Had to throw it away. I would love to chat with both of you one-on-one and see where the problem is. Did you add the sugar? Send me an email to tara@wholebodyliving.com and we can connect if you want to help me figure out what’s going on with your failed attempts. I don’t have Acacia Fiber, can I replace it with something else?